The 67.06m motor yacht Allure Shadow has now switched central agencies for the third time in as many years as a call to Moran Yacht & Ship confirms she's joined their sales fleet. She was built by Shadow Marine in 2007 to serve as a sports/utility superyacht. Accommodating 12 guests in six luxurious staterooms – all with private balconies - Allure Shadow has a vast range of features including a heli-deck with large hangar, on deck pool, games room, cinema, gym and a skylounge with panoramic views. 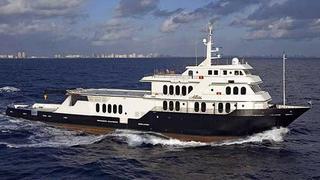 SOLAS classed and MCA compliant, Allure Shadow is asking $19,950,000.